Beware! 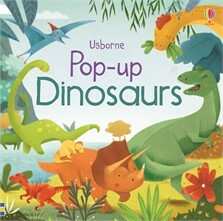 Open this book and all kinds of dinosaurs will pop out – huge ones, tiny ones, hungry ones, and a very, very noisy one. The 3D scenes show long-necked brachiosaurs munching leaves, nodding triceratops with sharp horns, and a scary T. rex with a very big ROAR. With simple text, this is a delightful book to share with little children.